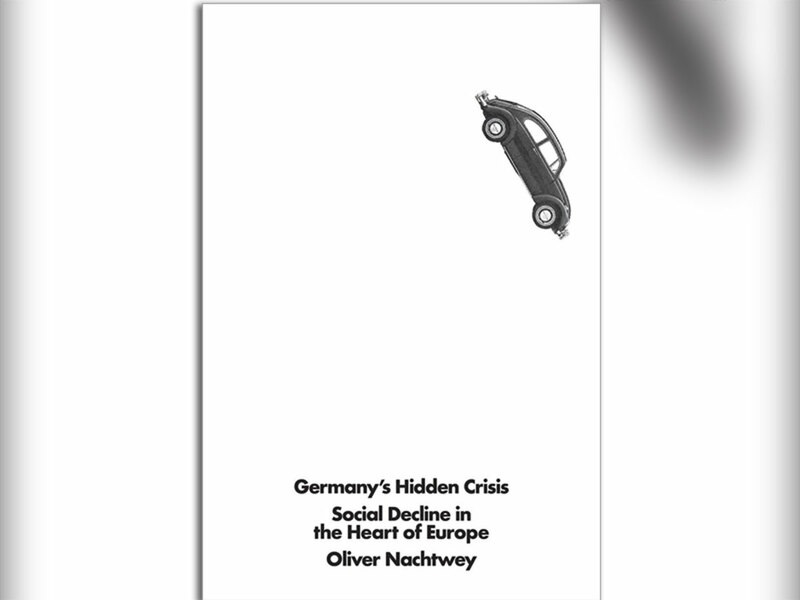 The cover of Oliver Nachtwey’s book depicts a VW Beetle, emblem of Teutonic manufacturing prowess since Hitler’s day, driving off a cliff. Is the country that got used to imposing its values on feebler client nations — bailing out southern Europeans with their oversized public sectors, rampant tax avoidance and long lunches — in trouble? The Germany described by this Frankfurt School professor is a basket case — post-growth, post-democratic, with the first fascists in the Bundestag since the Third Reich. Despite being Europe’s richest country, it has higher numbers of working poor than any other EU state; almost one in four of its workers is paid less than the €9.30 minimum wage, many requiring state support. Sociologist Ulrich Beck in the giddy 1980s called Germany an elevator society, in which millions of skilled workers upgraded from VWs to Audis and expected their children to rise still further in social status and wealth. The elevator may have seized up for a while after reunification, but only five years ago Germany seemed unstoppable. Every German, Beck thought, was in the same lift. No longer. Not only has downward mobility become more evident but the poor get poorer, the rich get richer, the older get tenure, the younger join the precariat. Sure, greater equality of opportunity means more women work than ever before, but of all German women in work only one in three earns the minimum wage. “So while German women are more equal in terms of rights, inequality between women has never been greater than it is today,” Nachtwey argues. This is symptomatic of what he calls regressive modernisation and of the following paradox: “The more a society is based on equality of opportunity, the more unequal it becomes, and the more legitimate its inequalities”. Legitimate? The losers are perceived to be those who deserve to lose, the winners those who deserve to win. And the losers are the usual suspects — women, immigrants, those who have no qualifications. A Germany that once prided itself on social mobility, and whose sociologists once crazily imagined class distinctions were over, has become, in terms of class, as sclerotic as Britain. In any case, equality of opportunity can only ever be an aspiration, never a reality. Nachtwey coins a new term to exemplify this situation. “Homogamy” isn’t the German answer to Scottish New Year celebrations, but the phenomenon whereby couples wed those of similar economic status. Surgeons no longer pursue nurses as they did when the former were most likely men and the latter women; now they go for anaesthetists or other surgeons. In one sense homogamy is desirable, because it means women are less dependent on status-asymmetric marriages; in another, it’s dismal because it constitutes a form of social closure where fear of the plummeting downward escalator haunts Germans’ dreams and determines life partners. Fear determines career aspirations too. Nachtwey notes that one third of all German university students are so terrified of joining the precariat that they aspire to government jobs. Better counting unemployment figures in a secure post with a decent state pension than risking redundancy at BMW. Germans with good degrees are becoming part-time kindergarten teachers. When did it all go wrong? Nachtwey goes back to August 15, 1971, when Richard Nixon buried the postwar order by taking the US off the gold standard. This was the day, Nachtwey argues, that neoliberalism was born. In the same year, Nixon had said: “We are all Keynesians now!” but one corollary of what became known as the Nixon Shock was to internationally integrate markets, thereby making national policies of Keynesian economic demand management that had characterised the golden years of postwar prosperity ineffective. He calls the Nixon Shock the revolt of capital, rather like the student revolts of three years earlier, but much, much more successful. The revolt of capital co-opted even social democrat chancellor Gerhard Schroeder, who becomes the villain of the piece with his Agenda 2010 policy statement ushering in Germany’s greatest postwar reduction in welfare services. The globalisation and deregulation of markets that followed the Nixon shock helped nations such as Britain, which thrived in the wild west of the financial deregulation, and opened new markets for German exports. But, the book argues, it also destroyed the socially democratic egalitarian Germany of widespread collective bargaining and welfare state provision prized by left-leaning intellectuals such as Jurgen Habermas. But Nachtwey also identifies his eminent predecessor at the Frankfurt School of Social Research, the doyen of 1960s radicals Herbert Marcuse as partly responsible for the crisis. In Marcuse’s countercultural hit One-Dimensional Man , he emphasised what Nachtwey calls artistic critique — stressing autonomy, self-determination and individual responsibility in preference to social solidarity and obeisance to straight society’s spirit-crushing rules. “The artistic critique thereby became an important source of neoliberal collusion,” Nachtwey argues. One corollary of this, he contends, is that today only 29 per cent of west German and 15 per cent of east German employees work for firms that have both collective bargaining and workers’ councils — twin facets of the country’s employment postwar norms. Marcuse the neo-Marxist thus helped facilitate in Germany something akin to what anti-Marxist Margaret Thatcher did to Britain, namely, as she put it, “to change the heart and soul”. Nachtwey arrives at another, related, paradox: the postwar welfare state was an essential precondition for realisation of the individual. But it is that very individual who slayed, under neoliberalism, the welfare state. All this would, if I’m honest, have filled me with schadenfreude were it not for the obvious realisation that the social decline Nachtwey describes is ours too. We too have kicked away the ladder and the safety net of the postwar consensus. We too have traded stability for precariousness, dignity for consumer goods, social solidarity for individual materialism. Germany in crisis is very like Britain — only better at making cars.